This family-owned winery in Nova Scotia’s Annapolis Valley is dedicated to certified organic and biodynamic agriculture alongside Old World winemaking techniques. The “Ancienne” tier of Lightfoot & Wolfville wines pays homage to tradition and to old-world winemaking techniques. 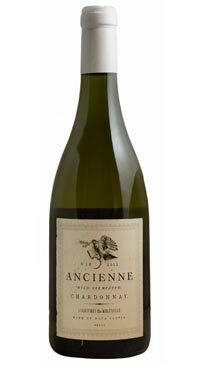 The Chardonnay is vinified according to traditional Burgundian winemaking techniques with indigenous fermentation and full indigenous malolactic conversion. Aged 18 months in French oak. A radiant golden-yellow hue glows in the glass. Fresh aromas of Meyer lemon and yellow pear are deepened by white truffle and hazelnut undertones. The palate is gracefully balancedbetween texture and acidity, and the finish between lushness and invigorating citrus-pith zest. A wine that pairs naturally with roasted poultry, fish, warm vegetable dishes, and cream sauces. Awarded the Lieutenant Governor’s General Award of Excellence in Nova Scotia Wines 2016. Only 160 cases made.